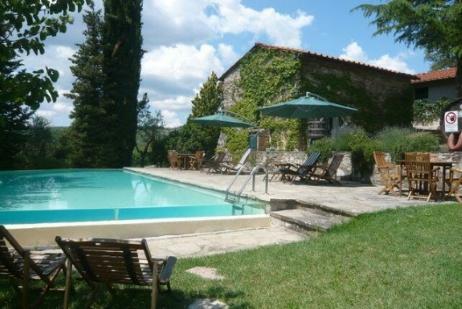 Gusto Cycling offers a minimum of a 3 night/ 4 day package in a variety of high quality hotels , castles , wine estates, agriturismo and apartments located in Gaiole in Chianti or Radda in Chianti to a wine estate 18km away from Gaiole. 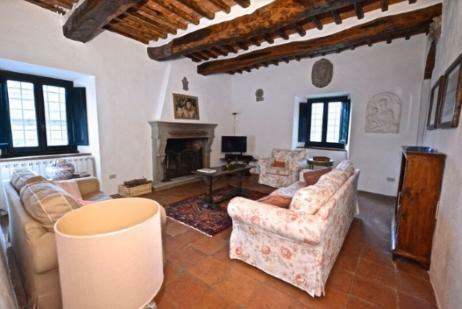 Extra nights to make a week long holiday in the Chianti region is easily arranged or for that matter a 2 centre break in 2 different locations within Tuscany region again can be arranged. You will be able to experience first hand the beauty of the Tuscan countryside whilst cycling in the stunning hills of Chanti, then making your way down the gravel paths with the wonderful view of Siena. L’eroica is an event that really shouldn’t be missed! The L’eroica ride event takes place on Sunday 6th October 2019 in Gaiole, Chianti a small town located between Florence and Siena. It’s perfectly located to enjoy the breathtaking views of the countryside and its many vineyards which you can easily visit as you cycle through the region. There are many unique features and highlights to look forward to with your partner, group of friends or a family reunion. If you do not have a vintage bike to bring do not worry my mechanic Stefano has over 40 vintage bikes and we rent them on a first come first basis which meets the strict criteria of participation. Cycle Through Amazing Tuscan Countryside – Book on to L’Eroica 2019! Every year over 7,000 riders from all over the world descended onto Gaiole in Chianti. What matters for L’Eroica is the love for cycling and the rediscovery of roads that haven’t been violated by time and asphalt. 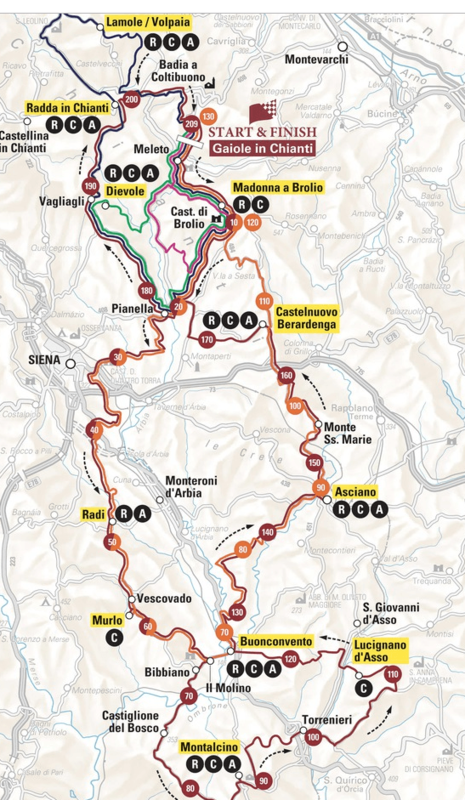 Routes that cross the lovely hills of the Sienese landscape and you will enjoy several free flowing descents. There are four routes available to participants: the longest is 205 km of which 110km is on unpaved roads: the second winds along at 135Km, of which 70km of unpaved roads: the third is 75km, of which 35km are on unpaved roads. The selection concludes with the shortest route of 48km, of which 15km is on unpaved roads. The elevation is 2380m. The departure is also staggered, depending on the route chosen:at 5am for those who have selected the longest route to 8.30am for those doing the third and fourth routes. 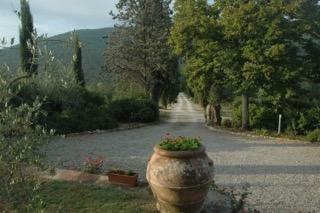 (1) Route – the permanent route that you’ll have to take to Tuscany is filled with adventure, fun, and of course nature. You will be refreshed, rejuvenated and thrilled by the end of your journey. Added to this, you will be provided with various information by GustoCycling, the travel and service partners of the event, to make your holiday memorable. (2) Rewards – the best reward would be the adventure that you are going to be experiencing. Other than this, you get the recognition of completing the event . Besides, you get to have the feeling of satisfaction for you would have supported a good cause and helped to preserve the Italian cycling tradition. 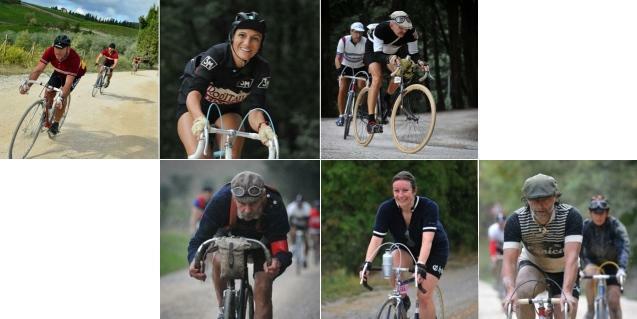 (3) Peers – participants of L’Eroica are not limited to any specific place. When you attend such a globally recognized event, you get to meet people and make friends from all parts of the world. You can establish many personal friendships along the way and feel very much part of the event as everyone is dressed in period clothes. (4) Sponsors – the event has grown to now encompass a number of Iconic Italian heritage brands such as Brooks and Bianchi steadily gaining increased popularity as the years are progressing. This has attracted a lot of smaller sponsors to invest with a large cycle jumble offering all types of bikes and components and even vintage clothes will exhibit their products all giving a wonderful relaxed atmosphere.. The most significant positive feature of the event is that Gusto Cycling is a major travel partner of the event. Providing guaranteed places and offering a wide range of accommodation choice from castles, to 15th century palazzo’s to wine estates and farmhouses Starting from good facilities . With the L’Eroica event happening in Oct 2019, it is vital you quickly get registered!” Click here to see what is this event really like? L’EROICA (french version) from Edouard Sepulchre on Vimeo. Florence international Airport is named after one of the most famous Italians : Amerigo Vespucci. There is no train connection with the airport to the city. From Florence railway station there are good connections to all kinds of cities in Italy. The airport is lies only four kilometers away from Florence. Shuttle buses leaving every 30 minutes. Florence airport is only 80 kilometres away from the airport of Pisa, Galileo Galilei. Pisa Airport is two kilometres from Pisa and 80 kilometres from Florence. You can find the train station just outside the terminal. Pisa Airport lies directly on the highway Florence-Pisa-Livorno. Because the airport is so close to the city a ride to the center of Pisa does not take more than ten minutes. Both airports are the gateway to Tuscany, one of the most popular holiday areas in Italy. There are many flights:for example to/from Madrid, Brussels, Amsterdam, Frankfurt, Berlin, Rome, London Heathrow, Copenhagen, Barcelona, Athens, Zurich and many more very important cities from all around the Globe. There are many trains in Tuscany from Florence or Pisa Airport or Lucca to Siena. L’Eroica celebrates it’s 23rd anniversary in 2019! Gusto Cycling is a key travel partner of L’eroica and are able to provide Guaranteed registrations and offer a wide range of high quality accommodation from Castles, Wine Estates, Agriturismo to excellent quality 4 & 5 star hotels. 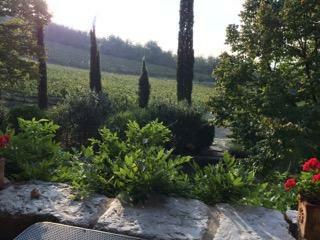 The event starts and finishes in Gaiole in the heart of Chianti in Tuscany. Packages are based on arrival FRIDAY 4th October – 3 nights accommodation with buffet breakfast in a range of wine estates, agriturismo to quality 4 and 5 star hotels Guaranteed Registration to participate in either the 48, 75, 135 or 205km route. Gusto Cycling will provide onsite support at the L’eroica 2019 event so you have everything taken care of. We will have a stand at the event throughout the weekend to meet and greet the Gusto team, collect your welcome pack, registration details and offer mechanical assistance at the stand as we have our own mechanic. If required I can also supply for rent vintage bikes to participate which meets the strict criteria of the event rules of participation. Gusto Cycling will provide Pre L’eroica information including routes and advice throughout the year leading up to the event. L’Eroica started in 1996 because of one man, Giancarlo Brocci, who admired the values of a past cycling so much that he wanted to reconnect others to the heritage that inspired much Italian history, literature, culture, and music. The main intent of organizing L’Eroica is to protect and uphold the heritage Tuscany’s “Strade Bianchi” white roads. L’eroica can also be known as ‘Eroica’ so don’t be confused between the two names as they are both the same event. Since 1997 the event has since grown with increasing number of people from all over the world converging on this little town to support the event every year. It has now become an epitome of clean cycling, environment preservation and of having a lifestyle that aids nature and sustainability. L’Eroica’s organizers make it a point to keep even non-participants informed and make them aware about the advantages of environmental friendly attitudes and habits. This shows the establishment’s commitment towards spreading the good word rather than just promoting their event. Please be aware that only 1,500 places are available for non-Italians, with Gusto Cycling you can have piece of mind if you book early you will be guaranteed places. L’Eroica is a vintage bike event with an amazing, unique atmosphere, full of colour and traditions of a bygone age. Here are the packages available for L’Eroica Tuscany 2019 – starting on Friday 4th October for 3 nights with a bed and buffet breakfast, if you wish to arrive earlier or stay longer this can be arranged. I have based it on 2 registrations per room double/twin…obviously there is a reduction if only 1 registration is required. Packages start from £366 per person. Room Amenities: Air conditioning, Telephone with external line, Dogs allowed, Hair dryer, Hydromassage bath, Laundry service, Internet access (WiFi), Mini Bar, Private bathroom & WC, Safe box , Desk, LCD TV , Satellite TV. Double Classic Room20 sqm – Free mineral water from the fridge and WiFi. Charming and comfortable double bedroom, furnished in style with modern services with cotto pavements. All the Classic rooms have mirror, writing table, luggage stand, table, arm chair, wardrobe, sat TV LCD, safebox, minibar with free water, direct telephone, heating and air conditioning. The Bathroom is in marble with a hydromassage shower or bathtub, courtesy products, mirror, hairdryer and American plug. 25 sqm – Free mineral water from the fridge and WiFi! Elegant, spacious and comfortable double bedroom, furnished in style with modern services with cotto pavements. All the Superior rooms have mirror, writing table, luggage stand, table, arm chair, wardrobe, sat TV LCD, safebox, minibar with free water, direct telephone, heating and air conditioning. Bathroom in marble with hydromassage shower or bathtub, courtesy products, mirror, hairdryer and American plug. Deluxe Double Room 30 sqm – Free mineral water from the fridge and WiFi – Jacuzzi TubElegant, spacious, comfortable and light double bedroom, furnished in style with modern services with cotto pavements. All the Deluxe rooms have mirror, writing table, luggage stand, table, arm chair, wardrobe, sat TV LCD, safebox, minibar with free water, direct telephone, heating and air conditioning. Bathroom in marble with hydromassage bathtub, courtesy products, mirror, hairdryer and American plug. – Pre L’eroica information including routes and advise throughout the year leading up to the event. Beautiful 14C 4 star Tuscan palace located in Radda In Chianti 8km from Gaiole..Palazzo LEOPOLDO…4 STAR hotel very historical 15th C building. 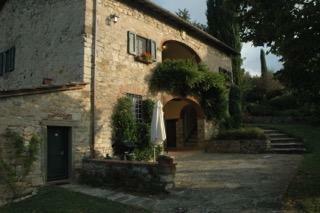 Radda in Chianti is a beautiful medieval town enclosed in large defensive walls. Located up on a hill between the valleys of Arbia and Pesa….here for non cyclists there is a lot more to do and see and the feed station is on the 75km & 205km route and comes through Radda! – Gusto Cycling support….we will have a stand to collect your registration and offer mechanical assistance at the Gusto Stand. Charming and spacious double bedroom, furnished in style with original cotto pavements. Some of them have roof with wooden beans. All the Classic rooms have mirror, writing table, luggage stand, table, wardrobe, sat TV LCD, safebox, minibar with free water, direct telephone, heating and air conditioning. Bathroom with hydromassage shower, courtesy products, mirror, hairdryer and American plug. Charming, spacious and light double bedroom, furnished in style with original cotto pavements. Some of them have roof with wooden beans. All the Superior rooms have mirror, writing table, luggage stand, table, armchair, wardrobe, sat TV LCD, safebox, minibar with free water, direct telephone, heating and air conditioning. Charming, spacious and light double bedroom, furnished in style with original cotto pavements. Some of them have roof with wooden beans or with frescoes. All the Deluxe rooms are very comfortable, some of them have entrance room and panoramic view. All they have mirror, writing table, luggage stand, table, armchair, wardrobe, sat TV LCD, safebox, minibar with free water, direct telephone, heating and air conditioning. This small 4 star hotel located 4km from Gaiole is situated in the green of the Chianti, the result of a careful restoration of an old mill of 1400. Everything has been conceived and designed with the sole intent of keeping the original atmosphere of this wonderful country cottage: stone walls, ceilings with exposed beams and terracotta floors! Do not miss the opportunity to stay at this little gem of hotel in the center of one of the most beautiful areas of Tuscany, Chianti. All the rooms have been designed with the right attention to detail in respect of the atmosphere of years gone by. The hotel rooms range from standard to superior to the finest suite and are all equipped with the usual comforts of a 4 star hotel: heating, minibar, air conditioning, telephone, satellite TV, hairdryer and safe. Cost from £459 per person sharing a double/twin room for 3 nights accommodation with guaranteed registration per person in a classic room. Spaltenna is an ancient feudal hamlet consisting of the ancient parish Church with tower-bell dating back to year 1000, the adjacent fortified monastery and of a small group of country houses, marvellous example of spontaneous medieval architecture. The castle and the church, whose first information date back to the year 1030, have the severe fortress look. The castle, rich in history and legends, is made precious inside by architrave ceilings and elegant portals. During the middle ages, the parish church had jurisdiction on the several hamlets in its surrounding area, such as Vertine, San Donato in Perano and Montegrossi. The Spaltenna complex, surrounded by vineyards and woods, overlooks a splendid valley in the heart of a region rich in castles and fortresses, ancient abbeys and medieval villages. This is a family owned winery and vineyard that is lead by a dynamic and young team. Just 5 km easy bike ride to the start and return after the event. The estate respects the traditions of the Chianti Classico area while applying innovative thinking in the vineyard and winery practices. Utmost importance is placed on observing and adapting practices to each different vintage. 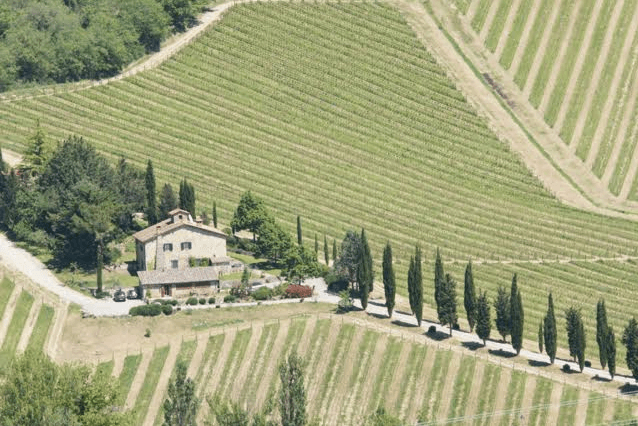 You have the opportunity to stay in this Vineyard, located 5km from Gaiole in Chianti which is a really special location with a stunning gravel entrance with cypress lined trees to the Villa. The accommodation is for 6 persons split with large ground floor apartment with a double bed and a 1st floor apartment 2 rooms one double and one twin both en-suite. Book on this classic Eroica Tuscany cycling event today to avoid disappointment as places are limited! Gusto Cycling can offer registration, accommodation and a vintage bike for the event. Contact marco@gustocycling.com to discuss options. Contact Marco Mori today to book your place on L’eroica 2019, this wonderful event is simply not to be missed! Just wanted to thank you for arranging a great trip for L’Eroica. It all went very smoothly and was so much fun. Loved Pallazzo Leoploldo (we still owe them a small bar bill but I will contact them directly, as we had to make an early departure), where staff were lovely and amazing terrace for Limoncello / beers as well as breakfast. Radda in general was very nice. Really enjoyed dinner on Friday night, especially with such glamorous company. The food was excellent too. Then of course the cycling was epic. Loved the atmosphere, bikes, people, and the route. We managed the 135km but felt a little tired after it (nothing a tagliata and bottle of Chianti couldn’t sort out). Remarkably, no mechanical issues , blow outs or injuries. We started slightly late at 07.30 but caught up with a lot of people, and really enjoyed it. Hope you had fun on the day. It was a shame the weather wasn’t like Saturday , but such is like. This year was probably the best to date, Paul agrees . Really enjoyable. The 135 km is a good distance without being excessive, and this year’s course was great, apart from some steep uphill strada bianchi! I don’t think I have it in me without serious training for the 209, but look forward to another 135, without any bother. Pre info. pack? OK, all we needed. Welcome pack-Very Welcome, a great souvenir package! I was 12 hours start to finish, with 8 hours cycling time. A bit slow, but it’s an experience, not a race, and needs be savoured! What is the fastest and the usual average time for the distance? Apparently, Jet2 are now flying into Pisa from Birmingham, so we could do it in a Taxi ride from Paul’s place on the morning of flight, rather than drive to Manchester and hotel night before, will sweeten things quite a lot. It was good to meet you, Helen and Massimo at last, and thank you for making the experience so enjoyable with such a personal level of service. We can’t find fault in any aspect you will be pleased to know! The booking was made so much easier I am sure by booking through you, the hotel was great along with the staff. I can’t suggest any aspect for improvement- you seem to have perfected it over the seven years! Clearly the event was totally brilliant again! Finally getting round the 209 (which probably should be called the 217?) was fantastic although now that I have finally hit that target I’m likely to go for the 135 in future and spend more time taking in the food and wine! + all good. Clearly I’ve now seen a lot of it before, but I remember the first time I rode that it was informative enough to remove any concerns about how the weekend and event would work – don’t change it! + After 4 years I seem to be a bit swamped but it’s still great and adds so much to the overall event! My office does appear to have been taken over by Eroica memorabilia! + The medal is a great addition this year (upon completion)… The wine whilst fabulous brought on logistical challenges with it not being easy to carry on a bike! Any improvements or comments to add for 2018? + Looking forward to next time and hoping it will remain just as great as ever! As you probably know already I had a great time and would highly recommend your services to anyone considering L’Eroica in Gaiole ! Awesome. Very good ! the only small thing I would say and forgive me for saying it but you sent lots of really useful info in emails across the weeks/months in the run up to the event but Si and I struggled to pull it all together again in the prep for the actual trip. We now have a master list for next time but have you thought about putting a master info pack together that way you (well we) don’t risk overlooking anything. Amazing venue, staff and village. I think Radda was one of the most beautiful villages we saw and think it is a great location… albeit at the top of a massive hill. LOL. Really unique and memorable. Something worth keeping. I really enjoyed the dinner you hosted. It was great to meet some other riders which are now friends. Any chance you can lay on a minibus next time that way we can all have a drink! Overall Gusto Cycling Services – Excellent. Great to get to meet you in person, as well as Helen and Massimo. The Friday dinner was wonderful, and we got to make some new friends as well. Accommodation where you stayed – Superb. Palazzo Leopoldo was very nice. Staff was wonderful, and the town of Radda a jewel. Pre—information supplied by Gusto Cycling – Very good info. Appropriate amount of communication, and good tidbits along the way. Welcome pack from L’eroica – Very nice memento from L’Eroica. Excellent that the items from Tuscany were included as a way of promoting the region. Any improvements or comments to add for 2018? – Two items: 1) That I get to attend, and 2) Must stay longer! The experience this year was great and I cannot think of something that could have been done better. Accommodations were perfect. The info emails all relevant and very helpful. Now that i have done the “original” twice, I will probably branch out and do a different one next year although the beauty of Chianti will be tough to top. Thank you for making this year a great experience. I did the 135km ride – you didn’t tell me it was actually 142kms! Really enjoyed the day. First 100kms were good, the next 40 was pretty tough. Got in around 4pm. Pretty wasted. Thought the trip was well organised. Info was all good. Loved the accommodation in Radda, and liked Radda. I would have payed extra for a transport option, both to get to the start, and especially for the diner on the Friday night. Great trip – thanks Marco. Thank you for organising this year’s L’Eroica trip. Great fun and a proper adventure. All feedback positive. The Palazzo Leopold in Radda excellent. Accommodation where you stayed.. very good. pre—information supplied by Gusto Cycling Very good. Welcome pack from L’eroica Very nice. Any improvements or comments to add for 2018? None.